Season two begins in a comfy home of someone we do not know going through a morning routine of exercise, eating, showering and playing “Make Your Own Kind of Music” by Mama Cass on the record player. Then, without warning, there is an explosion. The same explosion that blew open the Hatch at the end of season one. So someone had been living inside the Hatch this entire time. 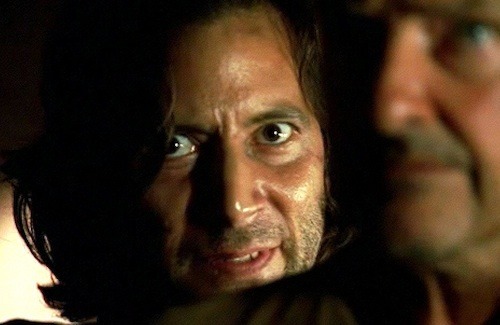 His name was Desmond Hume, and he will become one of the greatest characters in LOST. We see in flashbacks that Desmond and Jack had a meeting years before as both men were running the stairs of a stadium. Desmond was training for a race around the world and Jack was just trying to sort things out in his mind. This was the time referenced in season one where Jack “fixes” Sarah, who had broken her back in a car wreck (which was how Shannon’s father died). Jack was emotionally invested in Sarah’s recovery and he did not believe that there was any hope in the surgery. He believed that he failed and that Sarah would never walk again, let alone dance at her wedding. As he talked to Desmond about it, Desmond asked him if he did not believe in miracles? And of course, Sarah recovered feeling in her legs and did indeed dance at her wedding— to Jack as we saw in season one. One thought I had while watching Jack get all emotional over Sarah having feeling in her legs is “how can Jack expect to be a doctor if he is this crazed over every patient?” His stress level would have to be sky high. Locke and Kate climb down to the Swan station but gets caught by Desmond and he is holding Locke at gun point when Jack arrives. Jack takes this moment to condescend to Locke about his “fate” and makes some smart remarks. However, when Jack sees who is holding the gun on Locke, he recognizes him as the man at the stadium. Looks like Jack might have to swallow some of that fate talk as it is at the very least a HUGE coincidence. Greta episode to start the season, but it does not go and show us what has happened to the people on the raft. Shannon does see a drenched Walt in the jungle as she was looking for Vincent. Is it a psychic connection? It can’t really be Walt since he was abducted by the Others.